Rolf Parker is a newspaper reporter and local history writer. His stories are printed in the Deerfield Valley News in Wilmington, Vermont, and its sister publication, The Cracker Barrel. In preparation for these articles, he performs research using Chronicling America and other newspaper databases, as well as materials in the state archives, information on tombstones, postcards, letters, card catalogues of town vital statistics and other non-digitized sources. He has experience digitizing some of the many newspapers from the 18th and 19th centuries in the holdings of the Brooks Memorial Library, that currently are only available on microfilm. He also worked for six years assisting the reference desk at Landmark College, where he also worked as a writing instructor. 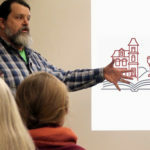 As a member of Write-Action, a non-profit that promotes writing and writers in southern Vermont, he also created an event at the library during the Brattleboro Literary Festival, during which attendees wrote a new chapter of the lost novel created by spiritualist con-man and newspaper editor T. P. James, who lived in Brattleboro in the 1870s. He has an M.S. in Entomology, Clemson University.